Definition at line 904 of file RegionInfo.h. Definition at line 906 of file RegionInfo.h. Definition at line 910 of file RegionInfo.h. Definition at line 80 of file RegionInfo.cpp. Definition at line 914 of file RegionInfo.h. Definition at line 97 of file RegionInfo.cpp. 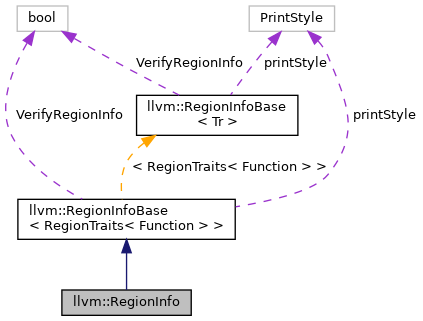 Referenced by llvm::RegionInfoAnalysis::run(), and llvm::RegionInfoPass::runOnFunction(). Definition at line 89 of file RegionInfo.cpp. Useful during debugging as an alternative to dump(). 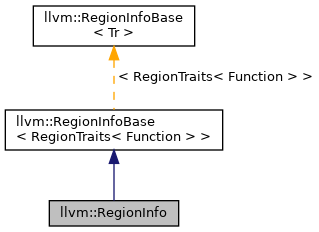 Definition at line 110 of file RegionInfo.cpp. Opens a viewer to show the GraphViz visualization of this region without instructions in the BasicBlocks. Definition at line 112 of file RegionInfo.cpp.